I mentioned last week that I wanted to get some Moda cross weaves after Kim sent us some for her bee block in January. While I was at it, I decided to also order some shot cottons. Believe it or not, I haven't used either before! I'm really glad I took the plunge. The cross weaves look beautiful and the shot cottons are incredibly soft and have amazing drape. I'm thinking of ordering more for a summer dress for my daughter. 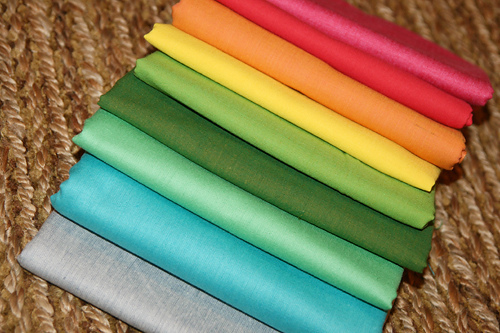 From top to bottom, the fabrics in the photo are...flamingo moda cross weave, scarlet shot cotton, tangerine shot cotton, lemon shot cotton, lime shot cotton, moss shot cotton, spearmint cross weave, sky cross weave, and blue-white cross weave. The cross weaves are from the Fabric Shack and the shot cottons are from The Needle Shop and Sheree's Alchemy.